Decorate your home, office or special event with this 10.5 inch Mirror and clear glass vase by Royal Imports. This beautiful straight mirror vase measures 4.5"X 2"X 10.5" tall. For a tiered floral effect, place a set of 3 mirror vases in the center of a table. Together they will create a fuller arrangement. Fill the vases with flowers and enhance it with gems or lights to make an even brighter centerpiece. Royal Imports brings the highest quality glass and mirror vases to the floral and craft industry. Each 4.5X10.5 mirror vase is crafted to classic quality using a combination of glass and fine mirror, thus creating a sleek, flawless centerpiece. QUALITY: 10.5" Mirror vase is crafted from a combination of fine mirror and crystal clear glass to maximize content visibility. 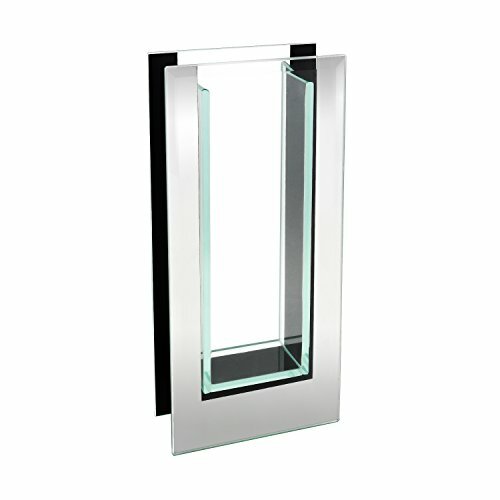 Each mirror vase features thick glass walls and weighted base to ensure durability. Imported. BEST SELLER: Mirror and Glass vases are a trending right now and are therefore best sellers in the floral supply, home décor, and wedding planning industry. From home decorators, to event planners, everyone makes use of a good quality mirror vase. It will enhance any romantic event, or even restaurant tables and parties when filled with flowers or vase fillers.